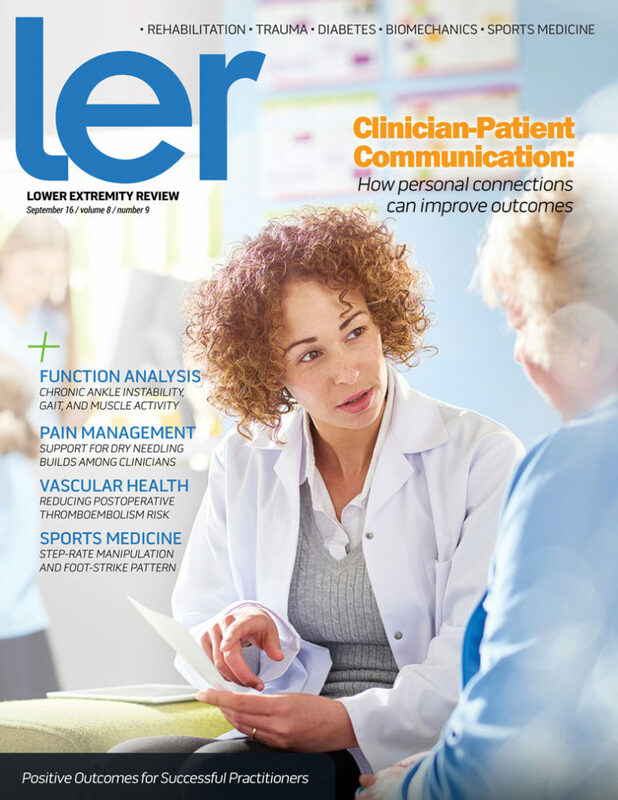 Increasingly, lower extremity practitioners are realizing the clinical importance of patient communication. They’re also starting to realize that effective communication requires more than just using the right words. National Football League (NFL) players say they worry more about lower extremity injuries than concussions. But a growing body of evidence suggests the latter injury actually increases the likelihood of the former. A growing number of people these days are looking for ways to reduce their carbon footprint and prioritize the environment. 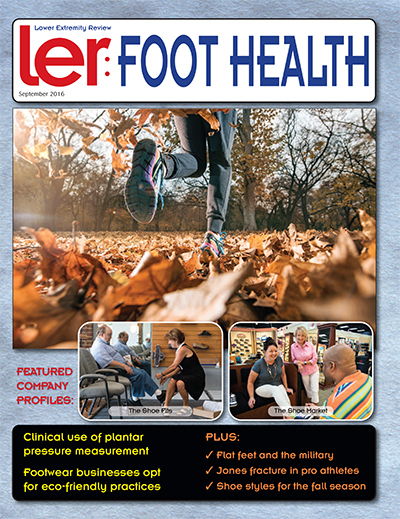 And, although they may not realize it, few healthcare professionals are better positioned to help the eco-friendly movement than foot-care specialists. A major exhibit at the Henry Moore Institute in Leeds, UK, explores the relationship between visual arts and prostheses. “The Body Extended: Sculpture and Prosthetics” traces how artists have addressed radical changes to the human body. Prairie du Sac, WI-based Mueller Sports Medicine announced in August that it is now an official team supplier of the UK’s Leicester City Football Club, defending Premier League champions. Winterthur, Switzerland-based Sigvaris Group announced in late August that the graduated compression company has completed its acquisition of BiaCare, headquartered in Holland, MI. San Rafael, CA-based Vionic on August 15 reported that Connie X. Rishwain, former president of Goleta, CA-based Ugg, has joined Vionic as president of its global business. The Washington, DC-based American Orthotic & Prosthetic Association (AOPA) honored Thomas Watson, CP, with its Lifetime Achievement Award at the 2016 AOPA National Assembly, held September 8-11 in Boston, MA. The American Society of Biomechanics has begun plans for National Biomechanics Day (NBD) 2017, scheduled for April 6. The University of South Australia in Adelaide announced in August that PhD candidate Joel Fuller won its 3MT (Three Minute Thesis) competition for his work exploring the link between trendy minimalist athletic shoes and injury. Mineral supplement seller Coral reported in August that the Food and Drug Administration (FDA) gave the company a perfect score in a surprise audit. The Charlotte, NC-based Orthotics & Prosthetics Activities Foundation (OPAF) on August 15 hosted a full-day First Swing Learn to Golf Training and Clinic as the kickoff event of the National Amputee Golf Association (NAGA) Championships at Pumpkin Ridge Golf Club in North Plains, OR. Cascade DAFO reported in August that its DAFO Creation Station, an online interactive tool for choosing colors and patterns for the Ferndale, WA-based company’s custom DAFOs (dynamic ankle foot orthoses) is available at cascadedafo.com. Virginia Polytechnic Institute and State University in Blacksburg reported in August that it plans to use Madison, NJ-based Quest Diagnostics’ blood testing service to look for associations between biomarkers and biomechanics, training, recovery, and other variables relevant to sports injury risk in some of its athletes. Exton, PA-based Ability Prosthetics and Orthotics and Freedom Innovations, headquartered in Irvine, CA, in September reported they are collaborating on a study comparing Freedom’s new Kinnex Microprocessor Ankle with a typical carbon fiber prosthetic ankle. Stoneham, MA-based Chaco’s founder and original designer of its sandals, Mark Paigen, announced on August 18 the wholesale launch of Tread Labs, a new line of orthotic insoles. The insoles’ features include four arch heights in sizes for men and women, easily replaceable Velcro top covers, and a lifetime guarantee. Gainesville, FL-based OPIE Software announced in August that Amplitude Media Group, headquartered in Northglenn, CO, is an integrated supplier. With this partnership, Amplitude Media’s Limb Loss Resource Guide (LLRG) can now be purchased digitally through the OPIE Software platform. Spinal Solutions announces the availability of the EZ-APO (Atlanta Prosthetics & Orthotics) ankle foot orthosis (AFO). The EZ-APO device is ergonomically designed to optimize fit around the footpad and malleolus and provide tibial tuberosity relief. Cascade DAFO announces the launch of the Creation Station for decorating custom dynamic ankle foot orthoses (DAFOs). With this new online interactive tool, DAFO users can “try on” various transfer patterns, ribbon trims, and strap and padding colors. For people who need to wear graduated compression every day but want to add a pop of color to their wardrobe, Sigvaris North America is launching two fun new additions to the Microfiber Shades line of compression socks—navy heather and graphite heather socks.